Your kitchen is the site of a lot more activity than simply preparing and eating meals. It is a place to socialize, devise life’s master plans and make memories. Being such an important space, your kitchen must be functional and aesthetically pleasing. This being the case, it is no wonder why kitchen renovation is at the top of home improvement lists all over the Dallas–Fort Worth metroplex. When the time comes to make kitchen renovations, team up with TriStar Repair & Construction, the premier remodeling and construction company that specializes in providing kitchen remodeling Highland Village, TX can trust. Granite countertops are durable, beautiful and add a stylish aesthetic to any Highland Village kitchen remodeling project. When it comes to tile, you have a lot of options from which to choose. Whatever your Highland Village kitchen remodeling specifications are, TriStar has the perfect tile flooring solution for you. Hardwood flooring adds timeless beauty and aesthetic value to any room, and it is a viable option for your Highland Village kitchen remodeling task. While it is possible to install these elements and remodel your kitchen yourself, we recommend having our skillful team professionally address the various elements you want to change about your kitchen in order to save you money and keep you as stress-free as possible. Whatever your remodeling project entails, count on TriStar’s Highland Village kitchen remodeling services to enhance your home’s aesthetic appeal and property value. There are about 15 thousand residents in this city, which means there are many ideas about what constitutes the perfect Highland Village kitchen. Luckily, TriStar’s team of professional renovators is up to the challenge. Perhaps you want new countertops, more cabinetry, new flooring or anything in between. Whatever you choose can dramatically enhance your kitchen and increase your home’s value. If you ever decide to sell your home, your kitchen could be a key selling point, so it would be beneficial to ensure it is a beautiful and functional space. Regardless of if you want to sell your home or enjoy it for years to come, contact TriStar Repair & Construction when it is time to remodel your kitchen. 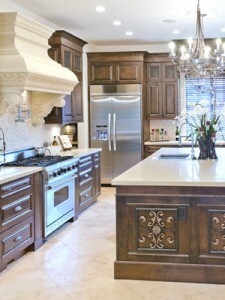 Why Team Up with TriStar for Highland Village, TX Kitchen Remodeling? TriStar Repair & Construction is the remodeling company that has provided kitchen remodeling Highland Village has trusted for nearly a decade. Our seasoned team specializes in offering only the finest kitchen remodeling services and stops at nothing to achieve complete customer satisfaction. When you team up with TriStar for your Highland Village kitchen remodeling project, you are choosing to do business with one of the most reputable home repair and construction companies in the area. Contact our Highland Village kitchen remodeling team at (940) 381-2222, or send us a message to learn how we can enhance your kitchen and add value to your home today!